What is the BEP, and what happens to a pumping system when a pump is not operated at the BEP? A: The BEP, or best efficiency point, is the point at which the pump operates at peak efficiency. At the BEP, flow enters and leaves the pump with a minimum amount of flow separation, turbulence, and other losses. The closer a pump operates to its BEP, the less wear the pump will experience, which increases the reliability of the pump. In the below image, the BEP is located at the apex of the pump efficiency curve (green line). If a vertical line is drawn from the BEP down to the pump curve (black line), the head and flow rate at the BEP can be determined by looking at where this line is in relation to horizontal and vertical axes. A closely related topic to the BEP is the preferred operating region, or POR. 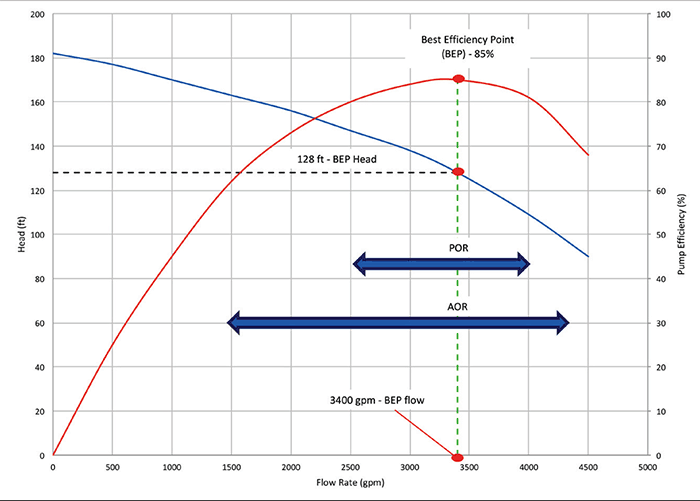 The POR is a range of rates of flow to either side of predicted BEP within which the hydraulic efficiency and the operational reliability of the pump are not substantially degraded. Within this region, the design service life of the pump will not be affected by the internal hydraulic loads or flow-induced vibration. Operating a pump within the POR ensures higher reliability and lower energy consumption. A typical range for the POR is shown on in Image 1. Note that the POR is defined in ANSI/HI 9.6.3 Rotodynamic Pumps Guideline for Operating Regions, and the POR changes depending if the pump radial (centrifugal), mixed or axial flow type. There are a multitude of negative consequences that arise when a pump is operated significantly above or below its BEP that can result in accelerated pump wear and premature failures. For example, operating at excessively low flow rates could cause higher radial loading on the impeller causing excessive shaft deflection leading to premature seal failures. At excessively high flow rates the pump’s required suction head may not be met and the pump could cavitate. For more information on pump operation see HI’s eLearning certificate course on pump systems assessments and ANSI/HI 9.6.3 Rotodynamic Pumps Guideline for Operating Regions at www.pumps.org. Q: What is the difference between inside-mounted and outside-mounted mechanical seals? A: Two categories of single mechanical seals are (1) inside-mounted and (2) outside-mounted. The primary difference between the two styles is that inside mounted seals are contained within the equipment seal chamber and outside-mounted seals are mounted external of the equipment housing. See Images 2 and 3 for diagrams of an inside-mounted and outside-mounted single seal. One disadvantage of inside-mounted seals is that they can be more difficult to install and maintenance usually requires disassembling the equipment. One disadvantage of outside-mounted seals is that they usually have lower temperature and speed limits due to lack of sufficient heat removal from the seal faces. Refer to HI Guidebook Mechanical Seals for Pumps: A Cost-Saving Guide to Proper Selection, Installation & Operation for more information on seals at www.pumps.org. See other HI Pump FAQs articles here.